Wow! Amazing quality at a great price. These night stands are solid and sturdy. The drawers are very deep and can hold anything you could possibly need. I ordered two of them on Thursday and they were at my door on Friday. Arrived fully assembled and without damage. If you are considering buying, don’t even think about it, just do it. You will not be disappointed. 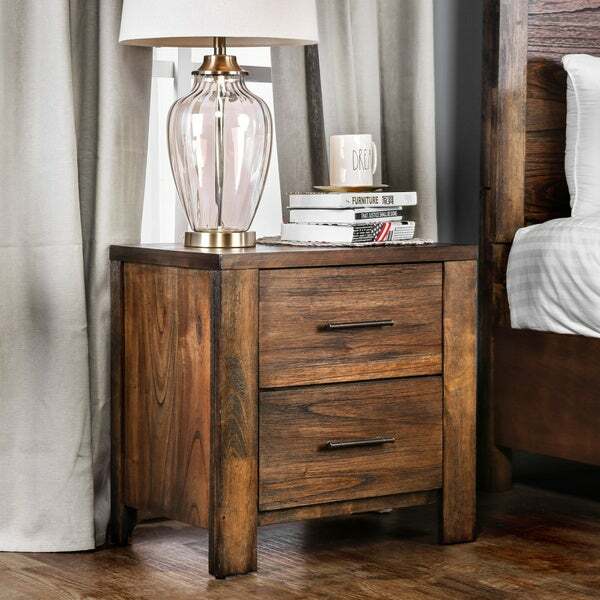 Cozy up in bed and enjoy the warmth and rustic appeal the oak finish and wood grain details of this transitional style nightstand brings to a room. Two roomy drawers add tons of functionality while the drawer fronts sport an antique handle for a sleek touch. Very nice addition to the Casso rustic bed, beautiful wood and great quality. The shade is darker than the pictures. I definitely recommend it! Loving these nightstands! Bought two for our master, was trying to match or at least compliment an existing tall dresser we have and these were perfect! Look exactly as pictured, came fully assembled just needed to put drawer pull on which was easy peasy. Very sturdy, will be purchasing matching dresser to complete the room. exactly as pictured. very sturdy. got two for our master. was pleasantly surprised to realize these come assembled (you just have to add the handles)! Nice, solid pieces of furniture. 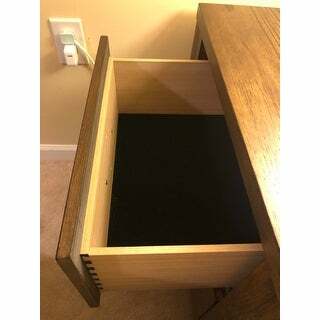 Top drawers have a felt lined board glued to the bottom. One of ours was jammed into the top, preventing the drawer from opening. But with some rattling, I got it loose and the drawer opened. Everything else went smoothly and they look great. Handles are replaceable if you wanted a different look. I enjoyed the bed so much i snagged the end tables. They seem very strudy and easy to use. The color matches the bed exactly. its nice they came pre-assembled. All you have to do is flipped the handles around from inside to out to make it operable. I would recommend these to anyone looking for modern rustic style to their home. Very nice piece of furniture. 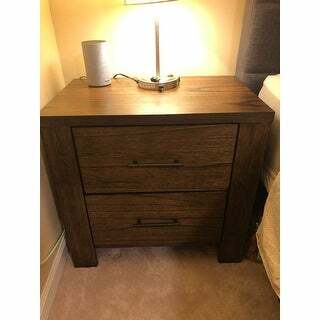 Looks like a higher quality item, is sturdy and blends well with the platform bed frame/headboard I recently bought online with Overstock. Comes assembled, which was an added plus for me since I don't like to assemble furniture. Only needed to adjust the drawer handle from inside to outside the Chest. Easy! 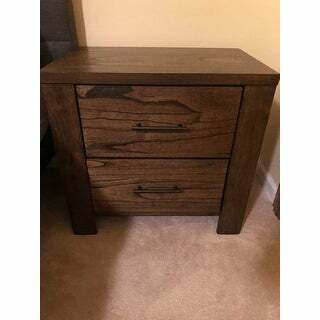 Overall, I recommend this brand and 2-drawer chest. The best thing is the chest came fully assembled! It is made from very good quality materials, dovetail finishing on drawers, and goes great with the bed. 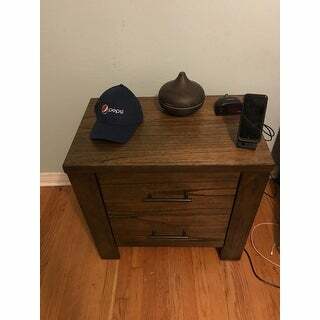 We bought two of these nightstands for our bedroom -- very high quality and ample space on top for lamp, etc. Beautiful color!!!! We love these nightstands!! I couldn’t have asked for a better nightstand. It’s sturdy, relatively cheap, and it even came assembled. Would definitely recommend. LOVE THESE! These were so easy to put together (just had to install the handles). They are super sturdy and look amazing in our room. I've looked at probably 100 options and am so glad I pulled the trigger on these! We’ve never had an “adult” matching bedroom set, and these are far better than any second hand side tables we’ve ever had! Bought the matching bedframe and both are excellent! A nice solid piece of furniture. Packaged extremely well. Completely put together. The only thing I did was put on the handle. Drawers are deep, which is exactly what we wanted. I'm very happy with my purchase. These came exactly as pictured. They aren't the best quality. We had a little damage when assembling, but now that they are in place, they look beautiful and function great. "the measurements most likely not correct 26inch wide?? please give me the correct measurements on this thanks"
The overall dimensions are approximately the following: 26”W X 16.5”D X 25”H. Time to upgrade our bedroom furniture and I wanted to start with the nightstands and go from there. The rest of the set looks really nice too, we shall see! "Is this nightstand made of solid wood or is it a laminate or veneer?" This nightstand is constructed of solid wood and wood veneer.